Currently, the Western Conservancy of Nursing History has collections from the former California Hospital, the Hollywood Presbyterian Hospital, and the Huntington Hospital. These collections include old nursing textbooks and memorabilia such as uniforms, tods and instruments, and photographs. View the California Hospital School of Nursing collection. 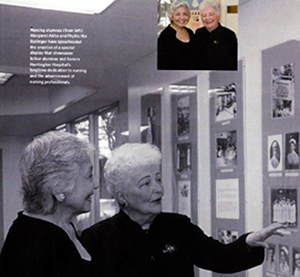 Nursing alumnae (from left) Margaret Akita and Phyllis Nie Esslinger have spearheaded the creation of a special display that showcases fellow alumni and honors Huntington Hospital’s longtime dedication to nursing and the advancement of nursing professionals. Historical preservation is one of the vital projects that the HMH/PCC Nursing Alumni Chapter has undertaken. Recently, HMH/PCC alumnae Margaret Akita and Phyllis Esslinger were honored in the Huntington Memorial Hospital’s Annual Report for their outstanding work to display the history of nursing at Huntington Hospital. An entire wall at Huntington Memorial Hospital is now devoted to the history of the school of nursing, complete with photos, documents, letters, and a mannequin outfitted in an official 1932 nurses’ uniform. Many of you are aware that PCC Nursing took root at Huntington Hospital in 1924. But as time marches on, the early alumni want to be sure that those who worked so hard to make advances in nursing possible will not be forgotten. 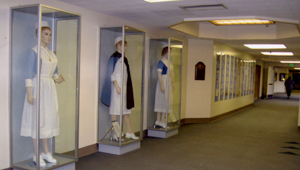 Mannequins are wearing period nursing uniforms in part of Huntington Hospital School of Nursing’s collection.